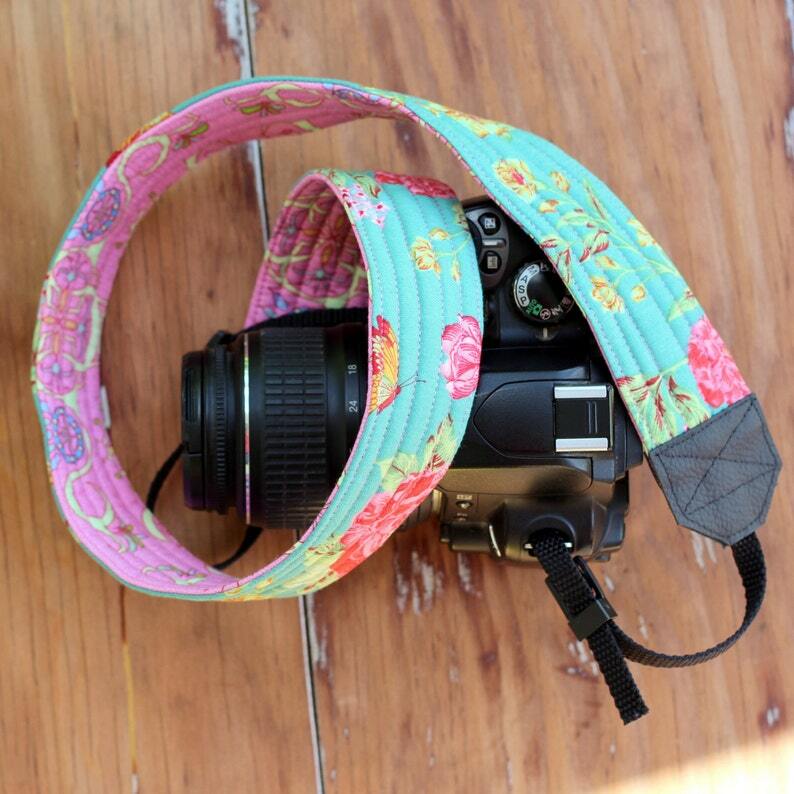 Take that amazing dslr camera up a notch with this rich pink and green floral reversible camera strap. This fun, beautiful strap is as much a fashion accessory as it is a practical necessity. As a gift or just for yourself it's sure to please. One side features a rich pink cotton with gold, green, and blue decorative detail. The reverse side stands out with vivacious pink and green flowers on a darker blue green cotton (darker than the images appear). The end pieces are black leather. The camera strap is comfortable when wearing and is crafted around strong webbing to create a strap that won't stretch and is sturdy enough to last for years. Snug, high quality end slides and keepers included. Handmade in a smoke free home in Southwest Florida. The cotton strap measures 30" by 1.5", with nylon straps adding another 10" on both sides of the strap. For a longer or shorter cover add a note when making the purchase, we're happy to adjust the size to your specifications. 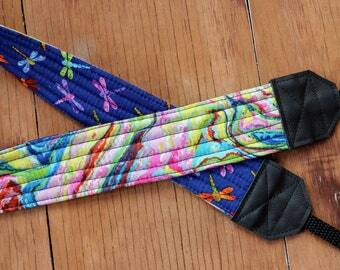 This made to order camera strap will ship within 3 days and US shipping is free. We suggest spot washing. If machine washing is needed, wash the camera strap in cool or warm water on a gentle or delicate machine cycle, to minimize typical fading with may occur over time as a result of washing. Tumble dry on a low temperature or permanent press setting and remove promptly. Thank you for supporting handmade artisans. Just the right length, nice support, well made, great fabric pattern! Get one— you’ll love it as much as I do!! If your item must be returned please contact me. Jude Harbor accepts returns within two weeks of item receipt and will refund the purchase price when the item is received by us. Yes, we offer wholesale pricing. Please ask for details.